Blue and White Always a Delight! Blue and white has been a staple of mine for years. I've slowly built a collection from a few pieces at Stein Mart to over twenty pieces plus two sets of 12 placesettings. I love these big fish bowls. 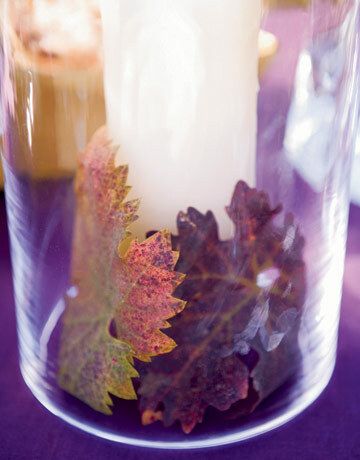 You can use them for vases, serving pieces for parties, even magazine holders. This collection of small blue and white sits on the shelves between my kitchen and tv room. A picture of my entry way in spring time. 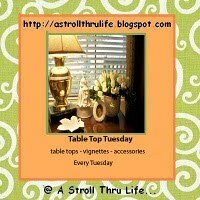 Here's an early tablesetting I did when I first started blogging last year. I like the blue and orange combination (hint - you'll see more of that this fall at the store). Think about some blue and white for your decor. It is a great "neutral" for any decor. 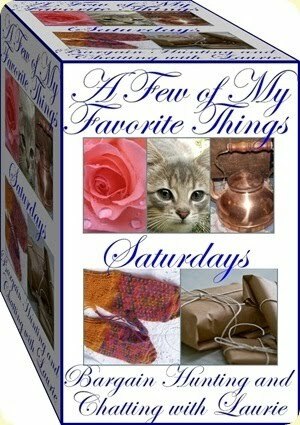 I'm joining Show and Tell Friday, My Favorite Things Saturday and Blue Monday. 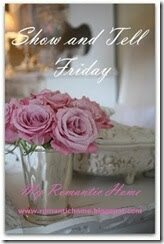 Please visit these blogs for more great posts! Things I'm Learning . . . Thought I'd share a few things I'm learning as I go along in the store opening process for those of you that thought you might want to open a small store some day. Most of this is common sense that I knew would be true and guess what it is! First, it has taken more of everything than I'd planned: more money, more time, more energy, more flexibility, you get the idea. Some background on me - my day job is as a Firm Administrator for a regional CPA firm. This means I run the day to day administrative functions of the firm: payroll, recruitment, financials, personnel, etc. I have had this job for 15 years so I'm pretty adapt at business management. I've run my booth space for three years so I have had experience with placing orders, stocking, pricing, etc., but there are still a thousand things that I did not have to do that I do have to do now that I'm a storefront. Start with a good business plan and budget. I don't know how many times I've gone back to that to stay on track. Stay true to your budget. This does not mean I've not had to move money around in categories, say for example, when the previous tenant took the light fixture - I had to buy one b/c I did not want to use the one the landlord offered. Money from marketing went over to supplies but the total budget remained the same. Have the support of family, friends, other retailers. I have wanted to bounce ideas off all kinds of folks along the way. It's hard when you are the sole decision maker. Get to know owners of similar shops so you can run things by them. Stay true to yourself. I think it has been tempting to try new things, copy what another store in the area is doing, etc. but I have not done that b/c I want my store to reflect my taste and vision. I think I offer nice products at reasonable prices and in the end the public will decide if that's good enough by either shopping or not. More later as I go along . . . have to go now and price three boxes of fall inventory!! Since I'm in full on autumnal mode for the new store, I thought I would share a few photos from my "inspiration" file with you guys today. with the golden tones of the leaves & gourds. 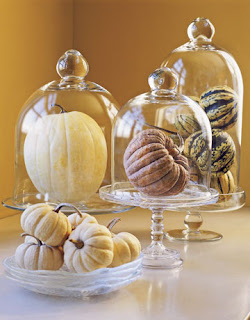 These images are from country living online. 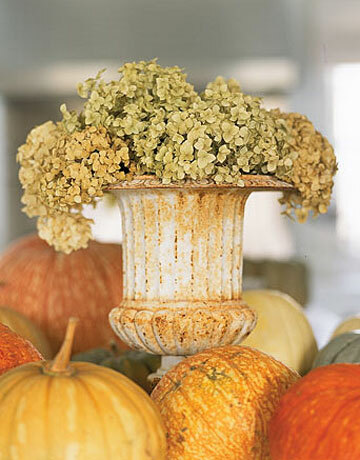 Hydrangea and pumpkins - yummy! The more subtle shades of fall are also appealing. 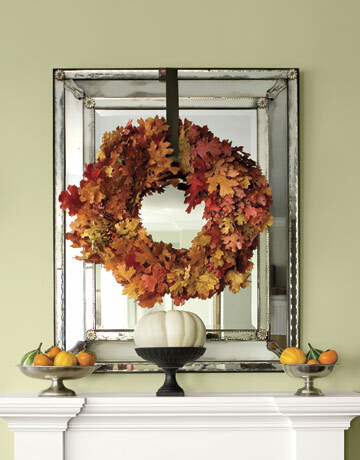 Hope this gets some ideas flowing for your house this fall. at a Stroll Thru Life. Saturday was moving day for the store. We moved from my double booth space in Taylorsville down the road about 20 miles to Louisville and my new store. was out at the booth space. department store with no ac and no fans. Miss B above summarizes how we felt once we got to the new store. one after another. Who knew I had so much stuff? Okay I knew I had so much stuff, but didn't want them too. More and more boxes and I became overwhelmed. opening day of August 7th? and pushed forward with their father. Miss B began organizing and "de-cluttering" right away. the store seemed to have some organization to it. that my new store is located. Historic Middletown offers many historic properties along Main Street. On the property of the Head House there are several out buildings. Including the old livery, which now houses a gun shop. This is the back of the building. I love those lanterns. This is the first barber shop in Middletown, which is no available for lease. There are several water garden features . . .
and places to stop and sit a spell . . .
And more landscaping and ironwork features to view. a character from a Jane Austen novel. The shop on the first floor has a great selection of garden items. at the front right -side of the house. the parking lot along side the house. Even decorative finals adorn the creekstone wall entry to the house. I am getting very excited for my August 7th open date! 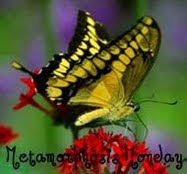 Today I'm joining Outdoor Wednesday. Well I haven't posted all week but I have been a busy girl. I have some exciting news I wanted to share with you, my blogging friends! I am moving from my double booth space at the antique mall in Taylorsville to a storefront in Middletown, KY. I have leased 310 square feet. Here's a picture of the front of the building, Miss B is modeling for us. I am in the upper right of the 2nd floor with two windows. I am soooo excited about being a real store owner. I have dreamed about having my own store for years. This is a great location with a restaurant and other stores on the property. It is a completely restored property with tons of charm. Here's my space in the "before" stage. I love the fireplace and the huge windows. The hardwood floors are in good condition. We came armed with supplies Saturday to begin painting. This nice message was left by my predecessors. Sharpie is going to take four coats to cover. They also took the light fixture so we're in the dark at sunset. Mr. B hard at work doing the brush work. Master B became an excellent roller. as I post each Monday the progress from today to my opening.